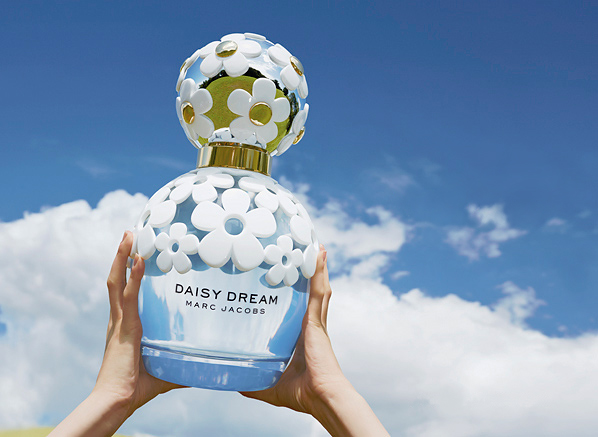 After the blockbuster successes of Daisy, Lola, Dot and Honey, Marc Jacobs is introducing a brand new fragrance to his whimsical scented universe: Marc Jacobs Daisy Dream. The delicious scent is a new addition to the iconic Daisy franchise, the arm of Marc Jacobs fragrances known for its ethereal elegance. Inspired by carefree, halcyon days, Daisy Dream is a sprightly fruity floral fragrance with an undercurrent of pale blue notes and an unexpectedly creamy dry down. The overall effect is wonderfully innocent, and completely mesmerising. Daisy Dream was developed by the creator of the original Daisy fragrance, Alberto Morillas (also known for Kenzo Flower, Lancome Miracle, Versace Bright Crystal), in collaboration with perfumer Ann Gottlieb and Marc. Inspired by the reverie of boundless fields dotted with daisies and bright blue skies, the scent presents a fresh new facet of easygoing Daisy charm. Though still in the same fruity floral category it’s a completely different juice to the original fragrance, with an airiness that sets it apart. The opening is dominated by the sublime freshness of grapefruit and pear, paired with the subtle sweetness of juicy blackberry. For such a fruity opening it’s refreshingly elegant, remaining bright and breezy throughout. The heart is decidedly ‘blue’, pairing sultry waves of jasmine with the clarity of blue wisteria and a touch of lychee. The base, for me, is where the fragrance really sings. Delicious waves of creamy coconut water paired with skin-like musks and white woods give a tactile feel that settles beautifully onto the skin. 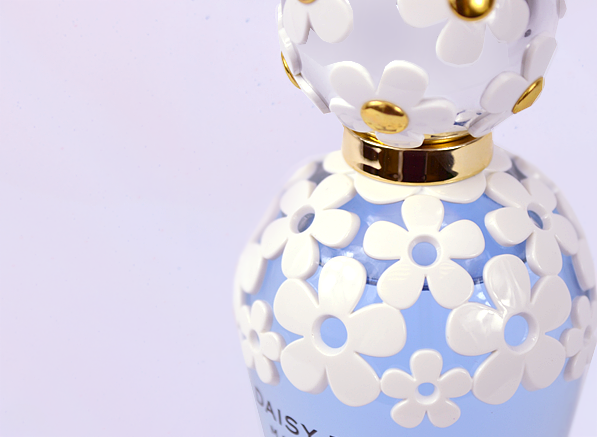 And if you think the fragrance sounds beautiful, the Daisy Dream bottle might just take your breath away. Created from heavy-bottomed glass with sleek, rounded shoulders, the design is a little more grown-up than recent Marc Jacobs offerings. The whimsical styling that MJ fragrances are known for is still very much there in the lace-like daisy design draped around the shoulders, and the spherical cap dotted with gold and white daisies (available on the 50ml and above). 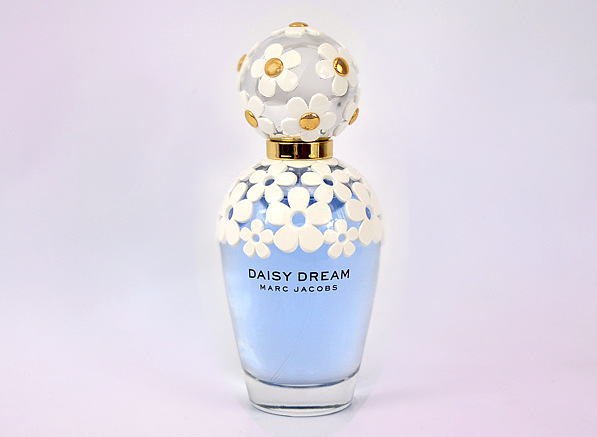 Filled with a sky blue juice reminiscent of clear summer days, Daisy Dream is as pleasing to behold as it is to wear. Available in 30ml, 50ml and 100ml Eau de Toilette Sprays, a Shower Gel and a Body Lotion. Love the sound of the fragrance? Click here to enter our competition to win 1 of 3 complete Daisy Dream fragrance sets worth RRP £99 each! Closes 23rd July 2014, usual T&Cs apply. This entry was posted on Tuesday, July 15th, 2014 at 8:00 am and is filed under Fragrance, Tried & Tested. You can follow any responses to this entry through the RSS 2.0 feed. You can skip to the end and leave a response. Pinging is currently not allowed.